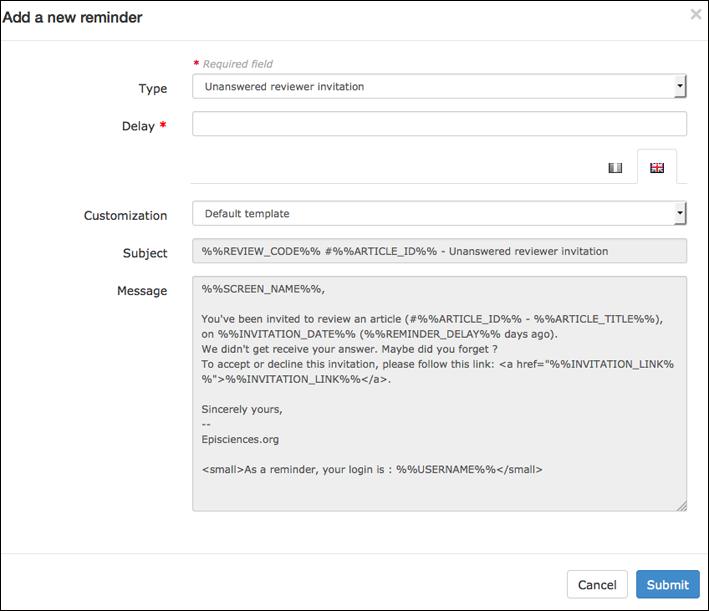 The menu to configure automatic reminders is Journal management/Mail/Automatic reminders. The delay box is a mandatory field and must be expressed in a number of days. This delay takes into account the rating delay defined in the journal settings. The number of reminder is not limited that will allow to define several levels of notices. A default template is provided but a customisation of the reminder is possible by clicking the menu. Click on submit to save your reminders. Note that the sending of the reminders is done at 00:00 every day. All messages are visible in Journal Management/Mail/History.